A huge shout out to Dr. Alex Molldrem, emergency veterinarian extraordinaire from Animal Emergency & Referral Center in Minnesota for creating this VETgirl online veterinary CE video for us! Likewise, thanks to NAVC VetEdge for posting this content! So, how do you do it? 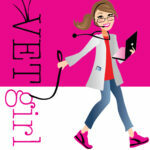 This VETgirl V-Blog demonstrates how to gastric lavage. Follow along with the steps below! 3. Sedate and intubate with ETT; secure ETT in place and connect to oxygen +/- inhalant anesthesia source. Inflate cuff to prevent aspiration of gastric contents or lavage fluid. 4. Monitor the patient appropriately. 5. Consider administration of an anti-emetic to prevent secondary aspiration (e.g., maropitant, ondansetron, etc.). 6. Place the patient in either sternal or right lateral recumbency. 7. Pre-measure an appropriately sized orogastric tube to the last rib (so you know the maximum distance to insert the tube) and mark this point with white tape. 8. Lubricate the orogastric tube, and pass the tube into the stomach using gentle, twisting motions. My hint? Blow into the other end of the tube to inflate the esophagus with air to help ease passing of the tube. 10. Once you’ve identified appropriate placement, infuse warm water by gravity flow via funnel, bilge/drench or stomach pump (I prefer the bilge). Copious amounts of lavage fluid can be used for gavage. Keep in mind that the stomach holds approximately 60-90 ml/kg. 11. Attempt to recover the gavage fluid by gravity, emptying it directly into the empty bucket. 12. While gavaging, make sure to frequently palpate the stomach for over-distension. Physical manipulation to massage/agitate the stomach is necessary to help break up stomach contents or bezoars; hopefully, this will allow small material to be removed via gastric lavage. 13. Perform several lavage cycles (>10) to evacuate stomach contents and maximize decontamination. Most of the gavage liquid should be removed prior to activated charcoal administration. 14. Make sure to evaluate the gastric lavage fluid for presence of toxicants (e.g., pills, plant material, etc.). This can potentially be saved for diagnostic evaluation or toxicology testing if malicious or unknown poisoning is suspected. 15. Before removing the orogastric tube, administer activated charcoal (with a cathartic for the first dose) via the tube, and flush it with additional water (or by blowing forcefully into the tube) to clear it out. 16. Kink the tube (to prevent lavage fluid from being aspirated) prior to immediate removal of the tube. Once kinked, the tube should be removed quickly in one sweeping movement. 17. Extubate the patient only when the gag reflex has returned. Ideally, maintain the patient in sternal (or slightly elevated) recumbency (with the head elevated) to prevent aspiration. What about post operative care?? They should recover quickly – make sure to give them maropitant before the gastric lavage, so you can minimize the risk of aspiration pneumonia from vomiting. Also, keep their head upright while recovering! What are the potential complications of inserting an orogastric tube? There are several contraindications for it – I’d check a toxicology reference for more info, but in general, rare risks of sedation, aspiration pneumonia, esophageal tear, stomach perforation (e.g., from corrosive injury, etc. ), etc. Maropitant, head elevation, keep them upright to minimize risks of aspiration.